Isovibe Freeride 1 1/8" bars - Grip N Rip Racing LLC. New Isovibe SX model designed specifically for 2011-2014 Skidoo Freeride and other models with 1 1/8" diameter bars. The Isovibe SX is designed to absorb the shock normally transferred to your wrists, shoulders and arms when landing jumps or hitting hard bumps with one ski. If you've even landed a jump wrong on one ski you've experienced the side to side impact to your wrists that sometimes rips the bars out of your hands. This new Isovibe SX will absorb this impact and keep you in control. 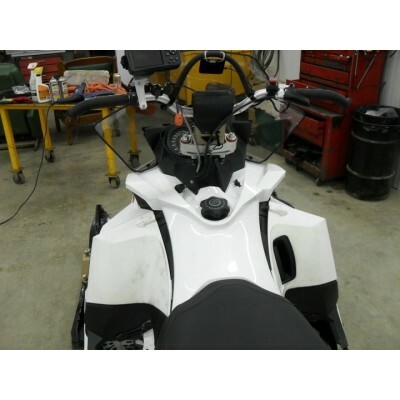 Fits 2011-present Skidoo Freeride and others with 1 1/8" bars. 1st and 2nd place teams in 2009 Cain's Quest race equipped with Isovibe SX, many teams also run them in the Iron Dog race in Alaska.